We invite you to take part in 29-й International Conference on Computer Graphics, Image Processing and Computer Vision, Visualization Systems and the Virtual Environment GraphiCon 2019, which will be held on September 23-26, 2019 at Bryansk State Technical University. The program of the event is supplemented by a youth session of young scientists. Students, post-graduate students and young scientists will present their reports during the session. Also there will be the exhibition and presentation of youth scientific and innovation projects. Participation in youth session will help young scientists to find like-minded people and to get some advice from lead scientists and industrial specialists about possible directions of further research and developments. It will also help to receive targeted support in the form of recommendations for participation in sponsored research programs. All conference participants will receive certificates of professional development. The best reports among the participants of the youth session will be awarded by diplomas. The reports of all participants will be published in the proceedings of the conference. The best reports will be recommended for publishing in the form of full-text articles in 4 scientific journals indexed in WoS and Scopus, and in journals approved by the Higher Attestation Commission of Russian Federation. We invite you to take a part in the 28th International Conference on Computer Graphics, Image Processing and Computer Vision, Visualization Systems and the Virtual Environment GraphiCon2018, which will be held on September 24-27, 2018 on the basis of the National Research Tomsk Polytechnic University. The program of the event was supplemented by a session of young scientists (for the first time). Students and post-graduate students will present their reports during this session. Also there will be a forum, which includes master classes about the organization of scientific, technical and innovative activities; lectures and presentations on the best Russian and foreign practices; popularization of scientific achievements. Participation in the forum of the youth session will help young scientists to find like-minded people and receive targeted support in the form of recommendations for participation in programs of funds. All forum participants will receive certificates of professional development. The best reports among the participants of the youth session will be awarded by diplomas and published. The abstracts of all the participants will be published in the proceedings of the conference. The best reports of scientists will be published in the form of full-text articles in 4 scientific journals, indexed in Scopus. Traditional 14-th International Scientific and Technical Conference OMFI (Optical Methods of Flow Investigation) will be held 26-30 June 2017 in Moscow. The conference has been organized since 1991. 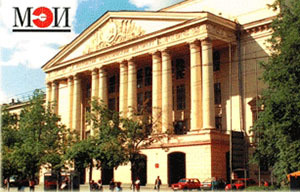 OMFI is a leading conference for this field of research in Russia. This event will be organized by National Research University «MEI», Institute of Thermophysics SB RAS and D.S. Rozhdestvensky Optical Society.